Based on the sheer number of vendors showcasing VR/AR products on the trade show floor of the conference, I would say that the arrival of VR/AR into the mainstream was one of the big themes of SXSW 2018. Augmented reality in the grocery aisles? I started the day with a visit to Accenture Interactive’s “Innovation Hub,” which was showcasing applications of Virtual Reality and Augmented Reality (VR/AR) in a variety of businesses, notably in customizing retail shopping experiences. (Accenture recently acquired a VR firm called Fjord, which serves as the consulting firm’s VR/AR unit.) 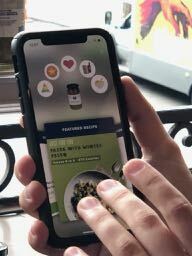 One pilot for Whole Foods’ 365 stores, which was on display, involves using mobile phones – and in the future, of course, wearables – to augment the physical, in-store shopping experience with virtual content overlays based on a user’s preferences, as expressed, for example, on a shopping list or a list of food preferences and allergies. It was very clever, but will it make the in-store shopping experience more compelling, or rather, is the future of the grocery business to make the ecommerce experience virtual, letting shoppers “walk” aisles from home and skip the store altogether? It will be interesting to see which VR/AR approaches win out in the grocery space. I don’t think it is Guinness Book-certified, but it was a very long cheese table indeed, courtesy of the Wisconsin Milk Marketing Board. Take a look.